Born Thomasina Montgomery on April 29, 1945 in Philadephia, Tammi learned to sing and play piano as a youngster, performing on TV and coming to the attention of Scepter Records, home of the Shirelles and Chuck Jackson. She cut sides there, for Chess and for James Brown, while joining the JB touring revue. The poster for a typical Mr. Dynamite show - this one in Springfield, Oregon on May 2, 1963 - was certainly provocative: "Sextra! New Singing Excitement! Tammy Montgomery." Harvey Fuqua had brought Marvin Gaye into Motown, so it wasn't a surprise when Tammi and the company's male heartthrob were teamed up. "[Marvin] and Harvey were the best of friends," remembered Bristol. "The four of us were like a little family thing, people who liked each other, there was a lot of kidding and laughing, which took away the tensions of recording." In song, Marvin and Tammi were born to be together. Working first with Johnny and Harvey, then with Nick Ashford and Valerie Simpson, they turned out a succession of soaring pop spirituals, typified by two of Motown's finest 1968 sides, 'Ain't Nothing Like The Real Thing' and 'You're All I Need To Get By.' Little wonder that the world fell at their feet, and that these songs have been sung many times since by the likes of Aretha Franklin, Johnny Mathis and Deniece Williams, Michael McDonald, My Morning Jacket, and Justin Timberlake and Beyonce. Yet Tammi's health was poor as her star ascended. The youngster had been suffering from severe headaches, and during a 1967 show with Marvin in Virginia, she collapsed onstage. The ailment was diagnosed as a brain tumour, requiring hospitalisation and frequent surgery. "When I learned just how sick she was, I cried," Gaye told biographer David Ritz. "Love seemed cruel to me. Love was a lie. Tammi was a victim of the violent side of love - at least, that's how it felt. I have no first-hand knowledge of what really killed her, but it was a deep vibe, as though she was dying for everyone who couldn't find love." Terrell succumbed on March 16, 1970 at age 24. The funeral was held at Philadelphia, at the Methodist church where she once sang in the choir. Of course, Marvin Gaye was among the mourners. 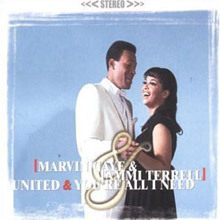 You're All I Need equals the debut of Marvin Gaye & Tammi Terrell in every way except chart position and newness. It reached number 60 on the pop charts, a good showing but 31 rungs lower than United, their debut. It includes arguably their finest recording, "You're All I Need to Get By," a testament to their singing skills and the writing/producing talents of Nickolas Ashford & Valerie Simpson -- and "Ain't Nothing Like the Real Thing" is no slouch either. The urgent "Keep on Lovin' Me Honey" is the lesser of three single releases, but a quality cut just the same, thanks in part to the twang in Tammi's voice on the uptempo pleader. Johnny Bristol and Robert Beavers' "Baby Dontcha Worry" gets an update; Johnny & Jackey first recorded the chugger on Harvey Fuqua's Tri Phi label in 1962. 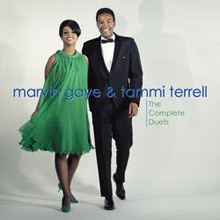 As on all three releases, Marvin and Tammi perform one of Tammi's solo cuts; in this case, "Come on and See Me" takes a backseat to the original. "Memory Chest," an overlooked number, is one of their most charming ballads. 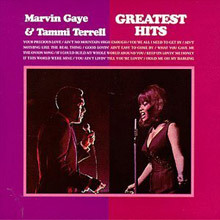 Most listeners will be satisfied enough with a best-of compilation to cover the work that Gaye and Terrell did together. Those who want to hear more should make The Complete Duets their next and only subsequent stop. The two-CD collection includes everything from their three Motown duet albums, along with the previously unreleased "We'll Be Satisfied," an alternate take of "Ain't Nothing Like the Real Thing," and an alternate vocal of "Keep on Lovin' Me Honey." For good measure, the second half of disc two is devoted to rare solo Terrell sides. That includes four songs from 1965-1966 singles, including the non-LP B-side "Baby Don'tcha Worry," all of which were also released as duets with added Gaye vocals; it sounds like they're trying to make her a mini-Mary Wells on "Hold Me Oh My Darling." There are also nine previously unreleased Terrell solo tracks (though all of the songs were also featured, with Gaye on duet vocals, on the Gaye-Terrell LPs). It would have been good for the otherwise satisfactory liner notes to include more specific details on those unreleased Terrell items, and in all the non-hits on the package are enjoyably generic late-'60s Motown, rather than being of particularly exceptional merit. At the same time, it's of reasonably strong consistency and a useful compendium of the total known output of one of soul's top duets. Hip-O Select’s 2010 set Come on and See Me: The Complete Solo Collection rounds up everything Tammi Terrell recorded on her own at Motown: the first disc contains 14 songs she recorded under the name Tammy Montgomery plus the Irresistible LP and two non-LP singles, “Baby Don’tcha Worry” and “There Are Things,” while the second disc has 18 cuts of Rare Motown capped off by Live at the Roostertail. Terrell’s trajectory is not dissimilar to other Motown artists of the ‘60s -- some of her earliest singles bear a bit of a heavy pop crossover bent, a trait amplified by the live supperclub showcase tacked on the end of this set, and she got looser and funkier as the decade rolled on, but even those early uptown shuffles are elevated by Terrell’s authoritative stamp. Surely, she was one of the few female soul singers who could take James Brown on and get a TKO, as she did on 1963’s “If You Don’t Think,” and some of the other early Montgomery sides are every bit as funky, but the centerpiece of this set is the Irresistible LP, where Terrell brought that spirit to snazzy, sophisticated pop-soul productions. 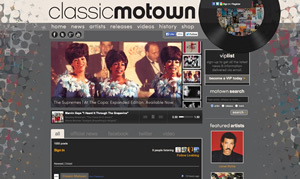 Irresistible boasts some of the thickest productions Motown issued in 1967, but it's underpinned by a heavy groove and graced with Terrell’s terrific singing. 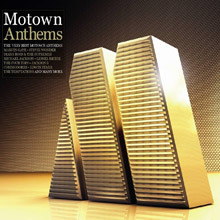 Apart from that perfectly fine, not necessarily compelling, live performance, the second disc has more unissued gems in this vein: it’s big, bright, lush, and powerful, the sound of Motown in full flight. 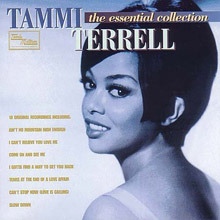 On the basis of her duets with Marvin Gaye alone, Tammi Terrell’s reputation is quite high, but this dynamic set proves that she was equally good as a solo act. Truthfully, sometimes she was even better on her own. A complete package of honey-coated goodies by the most charismatic duo to ever share a microphone. Aided by some excellent songs and productions by Nicholas Ashford and Valerie Simpson, Marvin Gaye and Tammi Terrell set a high bar for duets that will be hard to surpass. Tammi and Marvin songs were all tight, three-minutes-or-less testimonials about the joys of love. If Tammi hadn't left us so early, there's no telling where this exciting duo would have ascended to. Songs got longer in the mid-'70s, and my mouth waters visualizing Marvin & Tammi stretching out on drawn-out drama ballads similar to Rick James and Tina Marie's "Fire & Desire." Setting aside Marvin Gaye & Tammi Terrell's Greatest Hits and The Complete Duets (which anthologizes and collects, respectively) her 1967-69 material with Marvin Gaye, The Ultimate Collection is the best Tammi Terrell retrospective available. Thankfully including just one duet with Gaye, this Spectrum compilation features 17 solo tracks -- virtually all the material Terrell recorded at Motown on her own (even a solo version of her duet hit "Two Can Have a Party"). 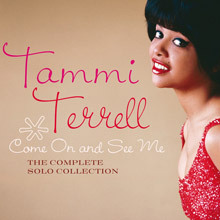 Beginning with her Motown debut "I Can't Believe You Love Me" and "Come on and See Me," her twin R&B hits during 1966, The Ultimate Collection proves Tammi Terrell recorded a lot of glorious solo material for Motown. She usually worked with Johnny Bristol and Harvey Fuqua, who made her a stunning alternative to Diana Ross or Martha Reeves with standouts like her cover of the Isleys' "This Old Heart of Mine (Is Weak for You)" or "Tears at the End of a Love Affair." The final song, included presumably just for comparison, is one of her finest Marvin Gaye duets: "Ain't No Mountain High Enough."